You may be wondering what exactly are the natural ingredients in the aloe vera plant that is so healing and healthful to us. The aloe plant, is not a cactus plant as my Dad thought, but an African plant from the lily family, and a succulent. That means it attracts and holds moisture well. It, is between 99 and 99.5 per cent water, with an average pH of 4.5. The remaining solids have over 75 natural ingredients including vitamins, minerals, enzymes, sugars, anthraquinones or phenolic compounds, lignin, saponins, sterols, amino acids and salicylic acid. - Want to look at them a little closer? The aloe plants have lots of vitamins, all except vitamin D, (sorry, I do not know why!) It does have the important antioxidant vitamins A, C and F. Vitamins B (thiamine), niacin, vitamin B2 (riboflavin), choline and folic acid are all in there too. Some researchers think there may also be a trace of vitamin B12 in the natural ingredients. Enzymes are catalysts. The ones said to be present in aloe vera, such as amylase and lipase, can aid digestion by breaking down fats and sugars. One important enzyme, a carboxy-peptidase, inactivates bradykinins and produces an anti-inflammatory effect. Sodium, potassium, calcium, magnesium, manganese, copper, zinc, chromium and iron are all ingredients found in the aloe plant. Magnesium lactate inhibits histidine decarboxylase and prevents the formation of histamine from the amino acid, histadine. Histamine is released in many allergic reactions and causes intense itching and pain. The prevention of its formation may explain the antipuritic effect of aloe vera. - in other words, it eases itching. Hallelujah! Sugars are found in the mucilage layer of the plant under the rind, surrounding the inner parenchyma or gel. They make up 25 per cent of the solid gel matter and comprise both mono- and polysaccharides. The most important chemicals are the long chain polysaccharides, made of glucose and mannose, known as the gluco-mannans. When taken orally, some of these bind to receptor sites that line the gut and form a barrier, possibly helping to prevent aleaky gut syndrome. Others are ingested whole by cellular absorption known as pinocytosis. Unlike other sugars which are broken down prior to absorption, the polysaccharides are absorbed complete and appear in the blood stream unchanged. Here, they act as immuno-modulators capable of enhancing and/or holding back the immune response. In plain English, when you have lots of these compounds they will purge your gut. In smaller amounts they will help your digestive system to absorb your food better. They also have power to fight microbes, and can ease pain. Applied on the surface they help you absorb ultra violet light, and hold back tyronase activity, and reduce the formation of spots on your skin. That's an inert woody matter that gives aloe gel the ability to carry other active natural ingredients right through and deep into your skin to nourish it. About 3 per cent of the gel consists of these soapy materials that act as antiseptics. These have names like Campesterol, f3 Sitosterol and Lupeol. Okay, they are anti-inflammatory agents. You may recognize this as the basis of aspirin, which fights inflammations and bacteria. On the surface of your wound, it will take away the dead tissue. Proteins are built of Amino acids. Aloe vera gel has 20 of the 22 necessary amino acids required by the human body and seven of the eight essential amino acids which the body cannot synthesise. These must be ingested in food. My conclusion is that this is definitely a plant that God has filled wtih good things for our health. 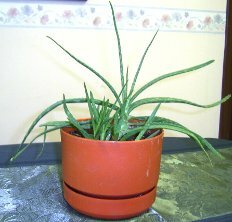 It is so easy to grow and care for some aloe vera plants as house plants that I think everyone should try to have at least one or more in their home. Have you got one? If not ask around, someone in your circle of acquaintance can probably give you your first starter aloe plant. Once you have one, there is no reason you can't propagate, or start more plants from the first one. I would even recommend growing them large - but then I may be an odd character! I can tell you where to find high quality aloe vera cosmetics!